The death penalty focuses on the killer and distracts us from identifying and meeting victims’ needs. The death penalty causes victims’ family members to relive the crime through years of appeals. The death penalty postpones necessary grieving and healing by putting the focus on the killer through long pre-trial, long trials, and long years of appeals. There is no guarantee of an execution with the death penalty. Many of Delaware’s death sentences were reduced to life in prison on appeal. The death penalty is not available most victims’ family members. It doesn’t apply in most murders. The killer may be dead. The case may not be solved. Even in those cases, victims’ family members still have needs. The death penalty is not designed to meet the needs of family members. It is designed to punish an offender. The death penalty is often pursued even when victims’ family members oppose it. The death penalty wastes precious resources that could go toward victims’ services or preventing future victims. The death penalty falsely promises closure for families. Grief doesn’t just disappear. “One reason I oppose the death penalty is because of the great suffering it inflicts on the family. I know it did in mine. Delaware reduces death sentences to life without parole more than 1/3 of the time. As long as we tell families that the death penalty is going to heal their pain, then we are setting them up for more torture. I’m waiting for the day when Delaware starts offering real support to families of murder in their grief and healing instead of the false promise of the death penalty.” – Kristin Froehlich, whose brother was murdered. On January 17, 2012, Delaware’s Governor Jack Markell took the unprecedented step of commuting Robert Gattis’ death sentence to life in prison without parole. Believe it or not, it was an immensely healing event for me, the sister of a Connecticut murder victim. It was healing because I was actively involved in the movement that brought about that decision for mercy. I joined with thousands of others in fellowship, love, hope, and joy. Sixteen years ago, my 22-year-old brother David and four of his friends were murdered in Georgetown, Connecticut. That event completely changed the direction of my life. I was traumatized, devastated, and depressed. I lost my beliefs that life was predictable and that people were trustworthy. I lost my bearings. Initially a capital case, preparation for the trial of my brother’s killer took several years. I started to pin my hopes on the trial to resolve some of my feelings. The delays were confusing and frustrating. Fortunately, a friend in my support group helped me understand that the trial was a separate process from the grieving and healing I needed to do. She explained that the legal process is designed to punish an offender, but not to heal those who have been victimized. Thank goodness my friend’s words freed me from that false hope. Eventually, the state of Connecticut abandoned seeking the death penalty because of the nature of the evidence. Had I waited for an execution to heal my pain, I would have been cruelly disappointed. I likely would have waited years for an execution that may never have come. During appeals, the horrible details of the crime would have been paraded over and over in the media and in court. During those years, my focus would have been on the killer. Having been freed from the expectation that an execution would heal my pain, I was able to get on with the necessary grieving and healing. I got to mourn my brother’s death and to celebrate his life free from the overwhelming burden of endless criminal proceedings. Because I was no longer depending on a trial or an execution to heal my pain, I was free to focus on productive ways to heal. I volunteered at my church. I went back to school for social work and became a therapist, even working at a women’s prison for a while. Eventually, I started working against the death penalty. I knew it didn’t fit with my values. 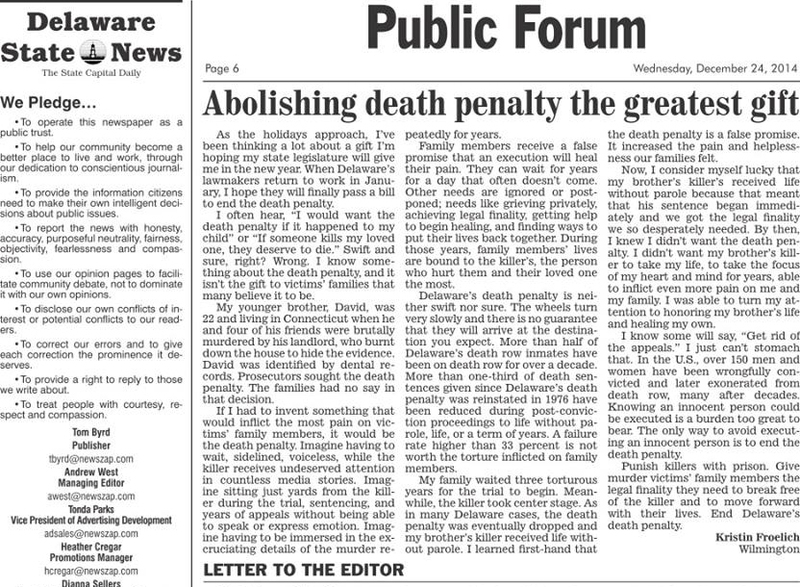 I joined the death penalty abolition group in Delaware where I live. Eleven years later, I am still involved in that work. Joining others to work for positive change has helped me heal far more than an execution would have. Doing this work, I learned new skills as I started telling my story in public. I met people who are dedicated, trustworthy, and compassionate. I learned that my own actions could make a difference. I learned that I was not powerless, but powerful. Over the years many have pronounced that an execution is the way that survivors of murder will be healed. They say, “The death penalty is for the victims.” That is not my experience. Grieving and healing are lifelong processes with no shortcuts. Working to abolish the death penalty may not be for everyone, but I recommend getting involved in any endeavor that works for life, for hope, and for peace. For statements from other victims’ family members visit Murder Victims Families for Reconciliation.